This category is used to write about display live cameras, live web cameras, wildlife cameras, and other interesting live video streams / feeds. Here are a few ways to use multiple HD CCTV cameras (AHD, HD-TVI, HDCVI) to Livestream video on Facebook and YouTube. 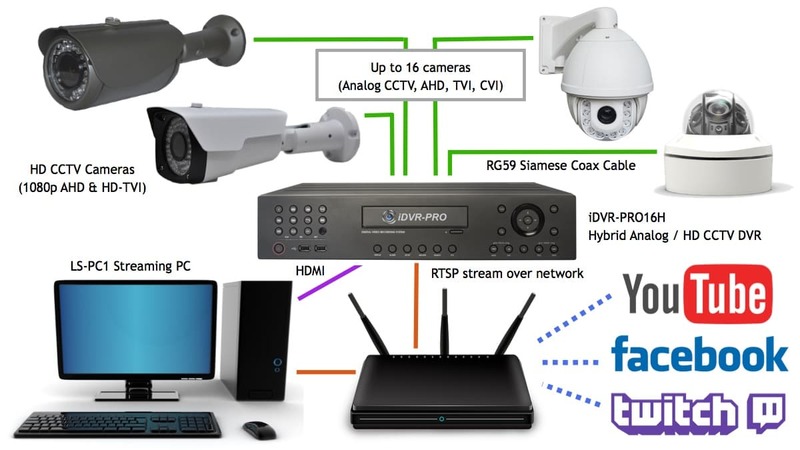 Video multiplexers and surveillance DVRs can both be used for these streaming live video when installed in conjunction with a PC with Open Broadcast software and an HDMI capture card. Learn more about this here. Want to learn how to embed a live video stream from a security camera on your website? This article documents one way to do it using an analog CCTV camera and network video server. I documented this setup based on my recent experience with a prospective business customer at CCTV Camera Pros.